TORONTO -- Students and faculty at some of Canada's post-secondary schools may soon have a tougher time doing research because the low loonie is forcing libraries to rethink what journals and books they stock. 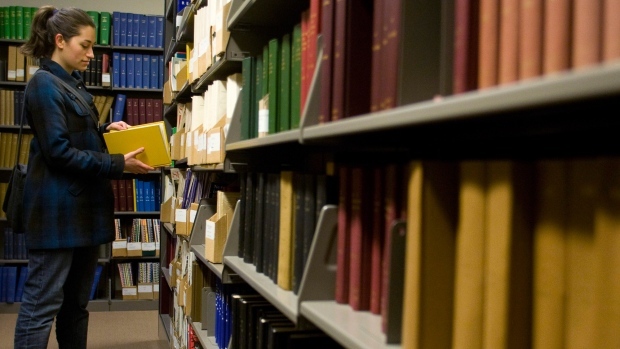 "The drop in the loonie has definitely decreased our purchasing power," Jo Anne Newyear-Ramirez, the associate university librarian for collections management at the University of British Columbia library, said in an interview. Journal subscriptions are often priced in U.S. dollars, and most university libraries pay for a majority of their collection purchases in American dollars. When the loonie started dropping against the U.S. dollar in the 2013-14 fiscal year, Newyear-Ramirez said, UBC library cancelled about $1.2 million worth of journal subscriptions. This year, the library halted some of its buying, she said, and plans to cancel more journals in the next fiscal year beginning April 1. It's "really tough" to decide what to cancel, said Newyear-Ramirez, who adds the library has already cut any material that may not have a direct impact if unavailable. "I really feel if we have to do any further cancellations, it is going to affect folks," she said, adding she's petitioned the university for more funding. The library is not alone in its conundrum. "We're all facing the same issue," Newyear-Ramirez said, adding she often speaks to colleagues at universities across Canada about operational cost woes. Many of the Ontario Council of University Libraries' 21 members anticipated spending eight to 12 per cent less in the upcoming year, the OCUL said in an open letter this past summer. Multiple members have already enacted varying degrees of cutbacks. Western University libraries, for example, announced in December that they froze new serials subscriptions, reduced book purchases and cancelled some serials to help reduce spending for this fiscal year and the next. Despite the University of Ottawa library receiving a onetime $500,000 budget top-up, it still had to trim more than $560,000 in serials and database costs, the library announced in July. It warned that additional cuts may be required in the 2016-17 fiscal year. Some universities' libraries have managed to keep their subscriptions so far, but are still feeling some financial strain. The University of Toronto libraries, for example, prepared reserve funds in anticipation of a low loonie, said Caitlin Tillman, the associate chief librarian for collections and materials management. Still, she's noticed a "substantial" difference in cost when paying U.S.-dollar invoices this year. While she's yet to cancel any subscriptions, Tillman said the library will be unable to purchase a lot of the special collections, like works at the Thomas Fisher rare book library, that it's been able to afford in the past. "As a cultural institution, we really are taking a hit." What if the loonie drops to below 60 cents US, as predicted by some doomsayers? "That'll be tight," Tillman said. Such cuts can damage a university's reputation, she added, and make it more difficult for faculty and students to conduct their research. And when it comes to purchasing library materials, Newyear-Ramirez said the loonie is only part of a bigger problem: the quick pace at which academic journal prices tend to rise. Librarians have coined the steeply rising prices the serials crisis. Since 2009, Newyear-Ramirez said, the UBC library has trimmed about $3.6 million in journal subscriptions. "Even if we were to have a strong dollar again, I think you would still hear that we're having issues with the pricing around this material."